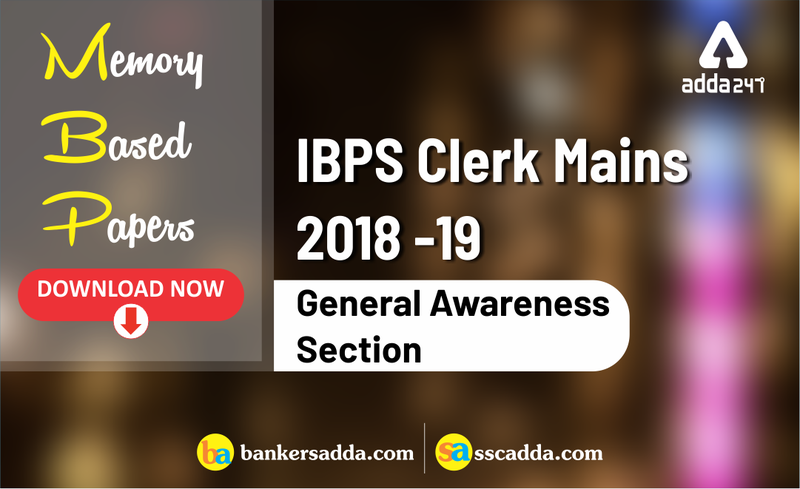 As the IBPS Clerk Mains 2018-19 exam is over, you all must be enthusiastically waiting for the Memory Based Question Paper of General Awareness. So guys here is the most awaited GA Questions entirely based on the pattern of questions asked this year. This memory-based paper in the form of multiple choice questions (MCQs) will help you to analyze your mistakes and rectify them in the upcoming exams of 2019. Current Affairs is an important section when it comes to Mains examinations. Doing Current Affairs must be a daily activity. You cannot master Current Affairs in one or two days. Make it a habit to read Current Affairs daily and revise the previous ones weekly. If you are targeting government job this year, then prepare Current Affairs of last 6 Months at least. Leave no stone unturned in your preparations and get your names in the list of selected candidates. Since the General Awareness section plays a crucial role in most of the mains examinations and having a strong hold over current affairs, static awareness, banking awareness will surely provide you an edge over your counterparts. To have a strong grip over general awareness section, follow www.currentaffairs.adda247.com, GK Update regularly. All the Best BA'ians for IBPS PO Interviews! !